Human Blood Types – Importance And Blood Typing Antigens & Antibodies In Abo & Rh Blood Type. Physiology ▶ Cardiovascular System ▶ Human Blood Types – Importance And Blood Typing Antigens & Antibodies In Abo & Rh Blood Type. Several different blood types occur in humans. The most familiar ones involve the ABO blood group (types A, B, AB, and O) and the Rh blood group (Rh+ and Rh-). Blood types are classified by the presence or absence of certain antigens, which are glycoproteins and glyco- lipids, located within the plasma membranes of the red blood cells. Each person has a unique set of RBC antigens that are inherited and remain unchanged throughout life. Within the plasma, an individual possesses antibodies against antigens that are not present on the RBCs. Remember, antibodies are defensive proteins produced by plasma cells. Whenever RBCs with one type of antigen are transfused into the blood of a person whose RBCs do not possess the antigen, the antigens on the transfused RBCs are recognized as foreign by the recipient’s antibodies and agglutination occurs. During agglutination, the recipient’s antibodies bind to the antigens on the transfused RBCs, which causes the RBCs to clump together. This reaction can be fatal because the clumps of RBCs block small vessels and deprive the tissues supplied by these vessels of nutrients and oxygen. of the 600 potential antigens on human RBCs, only a few can cause significant agglutination in a blood transfusion. These antigens are the A antigen, B antigen, and Rh antigen. The ABO blood group includes types A, B, AB, and O blood, which are classified by the presence or absence of A and B antigens on red blood cells. Type A blood is so named because its RBCs contain A antigens. Type B blood has B antigens on RBCs. Type AB blood has both A and B antigens on RBCs. In type O blood, neither A antigen nor B antigen is present. After birth, each person’s plasma cells start producing antibodies against the A or B antigen that is not present on his or her RBCs. As a result, people with type A blood develop anti-B antibodies in their plasma. Those with type B blood develop anti-A antibodies in their plasma. Those with type O blood develop both anti-A and anti-B antibodies in their plasma. People with type AB blood have none of these antibodies in their plasma. Blood typing also routinely tests for the presence of the Rh (D) antigen. There are several Rh antigens, but it is the D antigen that is of prime significance. The Rh antigen is named after Rhesus monkeys, in which the blood group was first discovered. If the Rh antigen is present on the red blood cells, the blood is typed as Rh positive (Rh+). If the Rh antigen is absent, the blood is Rh negative (Rh-). Like the A and B antigens, the presence or absence of the Rh antigen is inherited. Anti-Rh antibodies are not normally present in the plasma of Rh- persons. Instead, they are formed only when Rh+ RBCs are introduced into a person with Rh- blood. The first time this occurs, there is no agglutination reaction but the production of anti-Rh antibodies begins. The buildup of anti-Rh antibodies sensitizes the person to future introductions of Rh antigens. If a person with Rh- blood is sensitized and receives a subsequent transfusion of Rh+ RBCs, the anti-Rh antibodies will cause agglutination of the transfused Rh+ RBCs, usually with serious or fatal results. Anti-Rh antibodies are never found in individuals with Rh+ RBCs. A similar kind of problem occurs in hemolytic disease of the newborn (HDN), a blood disorder of newborn infants that results from destruction of fetal red blood cells by maternal antibodies. When a woman with Rh- blood is pregnant with her first Rh+ fetus, some of the fetal Rh+ RBCs may accidentally enter the maternal blood due to broken placental blood vessels. This occurs most often during the third trimester and childbirth. The introduction of fetal RBCs with Rh antigens triggers the buildup of anti-Rh antibodies in the woman’s blood. The buildup is slow but the mother has become sensitized to the Rh antigen. Hemolytic disease of the newborn may develop in a subsequent pregnancy with an Rh+ fetus because the anti-Rh antibodies in maternal blood readily pass through the placenta into the fetal blood, where they agglutinate the fetal RBCs. If a large number of RBCs are agglutinated and destroyed, the fetus has a decreased ability to transport oxygen. It is important to note that the anti-A and anti-B antibodies cannot cross the placenta and pose no threat to the developing fetus. In response to a decreased oxygen concentration, the fetal blood-forming tissues increase production of RBCs. In an attempt to rapidly produce RBCs, large numbers of nucleated, immature RBCs called erythroblasts are released into the blood. These immature cells are not as capable of carrying oxygen as are mature RBCs. Also, the destruction of large numbers of RBCs produces other harmful effects. Hemoglobin freed from RBCs may interfere with normal kidney function and cause kidney failure. Blood flow to other vital organs could also be blocked. The breakdown of large amounts of hemoglobin forms an excess of bilirubin, a yellow pigment that produces jaundice. Oxygen deficiency and excessive bilirubin concentrations in the fetal blood may cause brain damage in afflicted infants. Treatment of HDN at birth involves the replacement of the infant’s total blood volume slowly with Rh- blood. The transfused blood provides functional RBCs that cannot be agglutinated by anti-Rh antibodies that may still be present and reduces the bilirubin concentration to eliminate the jaundice. Subsequently, the infant’s own RBC production will again produce Rh+ RBCs but by then all anti-Rh antibodies will have been removed from the blood. When blood loss is substantial, blood transfusions are routinely given to replace lost blood. A blood transfusion is prepared by separating whole blood into its separate components through centrifugation (spinning it at high speeds). Once the plasma layer is removed, the compacted red blood cells are suspended in a nutrient-rich additive and are ready for transfusion. The removal of the plasma removes donor antibodies that can cause an agglutination reaction in the recipient. It is preferable to perfectly match the donor’s blood type with that of the recipient’s in blood transfusions. However, a compatible but different blood type may be used in an extreme emergency. If this is done, care must be taken to ensure that the antigens of the donor’s blood are compatible with the antibodies of the recipient’s blood. For example, RBCs with A antigen can be given to recipients with type A or type AB blood because neither type contains anti-A antibodies. However, if RBCs with A antigen were given to recipients with type B or type O blood, agglutination would occur because both types contain anti-A antibodies. Individuals with Rh+ blood can be given both Rh+ and Rh- blood types in a transfusion, because an Rh+ individual will never produce anti-Rh antibodies. However, individuals with Rh- blood are given only Rh- blood types to prevent sensitization and the formation of anti-Rh antibodies. Table below indicates the preferred ABO and Rh blood types that are used for transfusions. 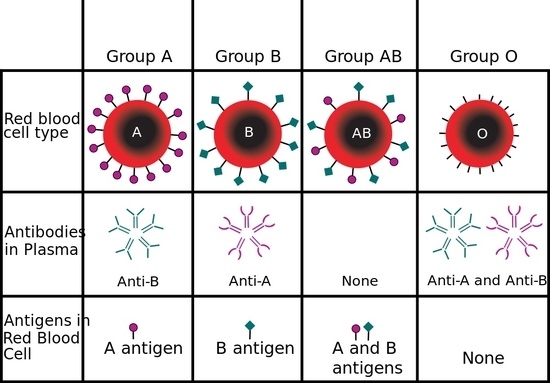 Blood types listed in this table are classified by combining the ABO and Rh groups; for example, type A— means the blood contains A antigens and no Rh antigens, type A+ means the blood contains both A and Rh antigens. Note that type AB+ blood may receive RBCs from all blood types and that the RBCs of type O— blood may be given to all blood types.